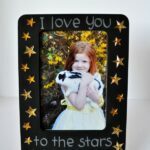 One of my most absolute favorite things in the whole wide World being a Mom is on Mother’s Day when I open up adorable hand crafted gifts from my children. No matter what it is…a note, card, painted picture, handprint art, doodle or pretty craft…I feel so special that my children made something especially for me. 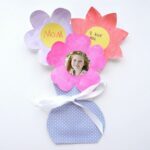 Last year we had a blast making Mother’s Day flower cards to give to our Grandmas and this year we wanted to follow suit and have been busy making this pretty Mother’s Day Flower Bouquet Gift. 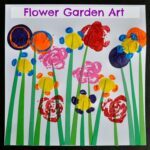 This pretty Mother’s Day flower bouquet gift is unbelievably simple to create and it makes such a bright and pretty decoration for Mom, Grandma or Aunt to display in their home. 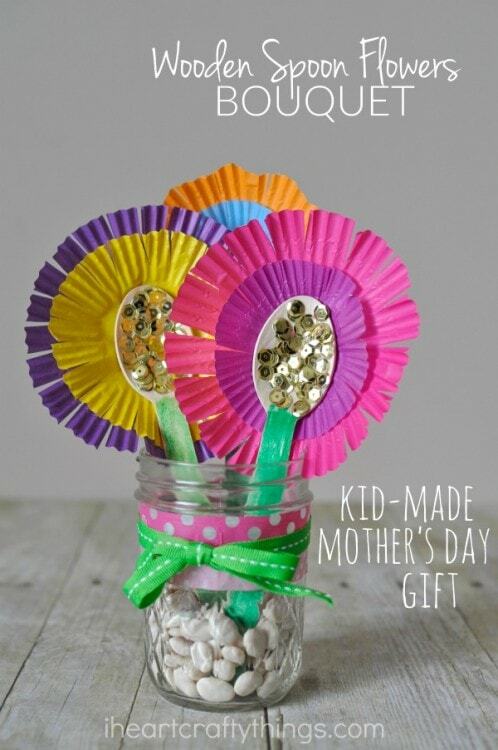 With such a myriad of cupcake liner colors and patterns available, there are so many fun flower variations kids can create making a truly unique Mother’s Day gift. 1. 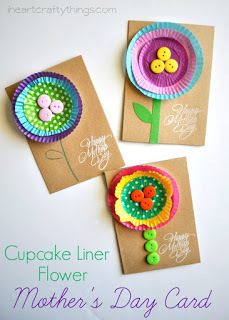 Start by picking out the cupcake liners you want to use to make your flowers. We choose a regular-size liner and a mini liner for each of our flowers. (You can make whatever combination you’d like though.) Flatten out both of your cupcake liners. Add some glue onto the center of your regular-size cupcake liner and glue your mini liner onto it, leaving the edges unglued to add a layering effect to your flowers. 2. 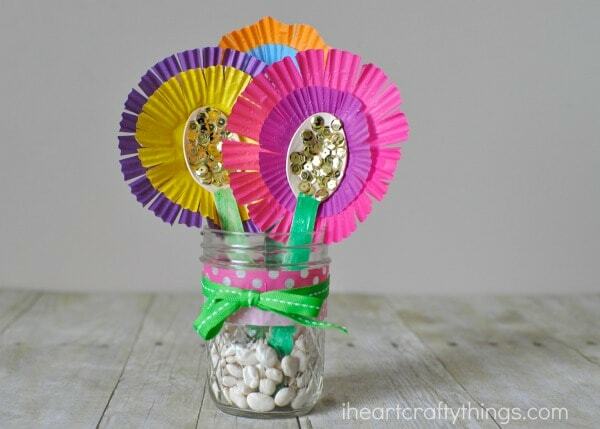 Use scissors to make slits around both of the cupcake liners to form flower petals. You could also cut the slits before gluing the liners together. 3. Use your green marker to color the bottom of your wooden spoon green. Add glue to the back of your spoon and glue them onto your layered cupcake liners. 4. 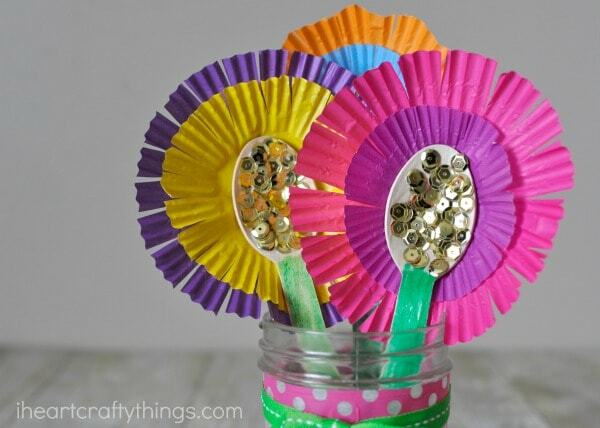 Add glue all over the top of your wooden spoon and sprinkle sequins onto it. 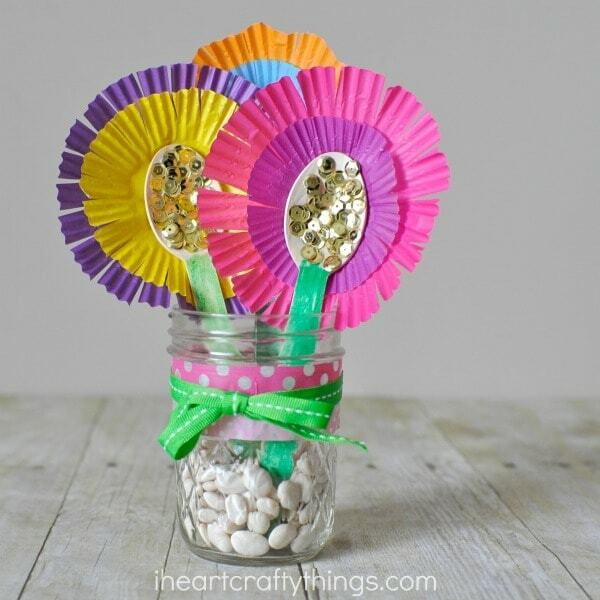 Lay your wooden spoon flowers out flat and let your glue dry. 5. Use a small mason jar for your flower vase. Wrap some washi tape around the top of it to give it some color. You could also tie a ribbon around it with a bow. 6. When the glue on your flowers is dry, fill your mason jar about half way full of white beans and then poke your flowers down into the beans to make a bouquet. I recommend using 2-3 flowers per bouquet.